I was reading a friend’s blog the other day, as she wrote about great gifts to get for a guy, and I thought, “I wonder if you can ask Santa for a new Washington Redskins GM for Christmas.” I sat down with pen and paper and wrote my list for the big guy the very next day. Well, for those non-believers out there, there absolutely is a Santa Claus. Vinny Cerrato has resigned (no, not re-signed… he quit) today as The Washington Redskins President of Football Operations. Already signed to replace him is Bruce Allen, former Tampa Bay General Manager and son of legendary coach George Allen. Let the speculation begin. What does this mean for the future of embattled quarterback Jason Campbell, or the current coaching staff? That remains to be seen. All eyes will certainly be trained on Redskins Park to see what comes out of the new football guy. In addition, Bruce Allen was the GM that brought Jon Gruden to Tampa. This is the same Gruden that the rumor mills listed as the front runner to take over if Jim Zorn was fired, and oh by the way, Gruden will be in town Monday for the game between the Redskins and Giants. Do I want to see Gruden become the new head coach for the ‘Skins? Not really, but that’s a story for another blog. Is the irony of the timing lost on me? Absolutely not. Regardless of whom the next coach is (and it could be the same as the current coach), a new guy will be making the decision. A change has been needed at the top of this organization since Marty Shottenheimer left town. Granted, as we’ve noted often in these Hog Blogs, the change only matters if Bruce Allen is given all the keys to the car and not just that funky looking one that you are supposed to give to valet parking attendants so they can’t get into the trunk. In other words, you’ve taken a step in the right direction by bringing in a football person to make the decisions prior to making the decisions for him Mr. Snyder. Now — and with all due respect — BACK OFF!!! While it has become almost painful to watch the Redskins fumble through each and every week, it’s our job at THN to keep bringing you the news – no matter how ’embarrassing’ some of it might be. 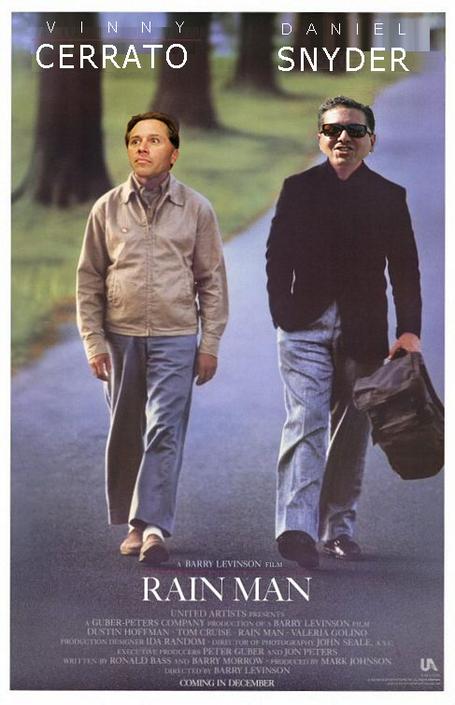 Dan Snyder and Vinny Cerrato star in Rain Man! The office was large and plush. The 15-foot ceilings and large windows made even the largest of defensive linemen feel small. To one side was an equally large fire-place and in the middle or the room, with the windows behind it, was the desk of one Daniel M. Snyder.